Andronikos II Palaiologos (Greek: Ἀνδρόνικος Βʹ Παλαιολόγος; 25 March 1259 – 13 February 1332), usually Latinized as Andronicus II Palaeologus, was Byzantine emperor from 11 December 1282 to 23 or 24 May 1328. He was the eldest surviving son of Michael VIII Palaiologos and Theodora Doukaina Vatatzina, grandniece of John III Doukas Vatatzes. Andronikos II was born Andronikos Doukas Angelos Komnenos Palaiologos (Greek: Ἀνδρόνικος Δούκας Ἄγγελος Κομνηνός Παλαιολόγος) at Nicaea. He was acclaimed co-emperor in 1261, after his father Michael VIII recovered Constantinople from the Latin Empire, but he wasn't crowned until 1272. 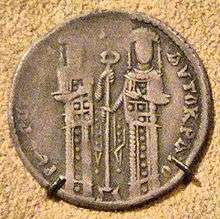 Sole emperor from 1282, Andronikos II immediately repudiated his father's unpopular Church union with the Papacy, which he had been forced to support while his father was still alive, but he was unable to resolve the related schism within the Orthodox clergy until 1310. Andronikos II was also plagued by economic difficulties. 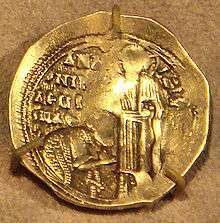 During his reign the value of the Byzantine hyperpyron depreciated precipitously, while the state treasury accumulated less than one seventh the revenue (in nominal coins) that it had previously. Seeking to increase revenue and reduce expenses, Andronikos II raised taxes, reduced tax exemptions, and dismantled the Byzantine fleet (80 ships) in 1285, thereby making the Empire increasingly dependent on the rival republics of Venice and Genoa. In 1291, he hired 50–60 Genoese ships, but the Byzantine weakness resulting from the lack of a navy became painfully apparent in the two wars with Venice in 1296–1302 and 1306–10. Later, in 1320, he tried to resurrect the navy by constructing 20 galleys, but failed. Andronikos II Palaiologos sought to resolve some of the problems facing the Byzantine Empire through diplomacy. After the death of his first wife Anne of Hungary, he married Yolanda (renamed Irene) of Montferrat, putting an end to the Montferrat claim to the Kingdom of Thessalonica. Andronikos II also attempted to marry off his son and co-emperor Michael IX Palaiologos to the Latin Empress Catherine I of Courtenay, thus seeking to eliminate Western agitation for a restoration of the Latin Empire. Another marriage alliance attempted to resolve the potential conflict with Serbia in Macedonia, as Andronikos II married off his five-year-old daughter Simonis to King Stefan Milutin in 1298. In spite of the resolution of problems in Europe, Andronikos II was faced with the collapse of the Byzantine frontier in Asia Minor, despite the successful, but short, governorships of Alexios Philanthropenos and John Tarchaneiotes. The successful military victories in Asia Minor by Alexios Philanthropenos and John Tarchaneiotes against the Turks were largely dependent on a considerable military contingent of Cretan escapees, or exiles from Venetian-occupied Crete, headed by Hortatzis, whom Michael VIII had repatriated to Byzantium through a treaty agreement with the Venetians ratified in 1277. Andronikos II had resettled those Cretans in the region of Meander river, the southeastern Asia Minor frontier of Byzantium with the Turks. After the failure of the co-emperor Michael IX to stem the Turkish advance in Asia Minor in 1302 and the disastrous Battle of Bapheus, the Byzantine government hired the Catalan Company of Almogavars (adventurers from Catalonia) led by Roger de Flor to clear Byzantine Asia Minor of the enemy. In spite of some successes, the Catalans were unable to secure lasting gains. Being more ruthless and savage than the enemy they intended to subdue they quarreled with Michael IX, and eventually openly turned on their Byzantine employers after the murder of Roger de Flor in 1305, devastating together with a party of willing Turks Thrace, Macedonia, and Thessaly on their road to Latin occupied southern Greece. There they conquered the Duchy of Athens and Thebes. The Turks continued to penetrate the Byzantine possessions, and Prusa fell in 1326. By the end of Andronikos II's reign, much of Bithynia was in the hands of the Ottoman Turks of Osman I and his son and heir Orhan. Also, Karasids conquered Mysia-region with Paleokastron after 1296, Germiyan conquered Simav in 1328, Saruhan captured Magnesia in 1313, and Aydinids captured Smyrna in 1310. Gold hyperpyron of Andronikos II, kneeling before Christ. The Empire's problems were exploited by Theodore Svetoslav of Bulgaria, who defeated Michael IX and conquered much of northeastern Thrace in c. 1305–07. The conflict ended with yet another dynastic marriage, between Michael IX's daughter Theodora and the Bulgarian emperor. The dissolute behavior of Michael IX's son Andronikos III Palaiologos led to a rift in the family, and after Michael IX's death in 1320, Andronikos II disowned his grandson, prompting a civil war that raged, with interruptions, until 1328. The conflict precipitated Bulgarian involvement, and Michael Asen III of Bulgaria attempted to capture Andronikos II under the guise of sending him military support. In 1328 Andronikos III entered Constantinople in triumph and Andronikos II was forced to abdicate. Andronikos II died as a monk at Constantinople in 1332. Michael IX Palaiologos (17 April 1277 – 12 October 1320). Constantine Palaiologos, despotes (c. 1278 – 1335). Constantine was forced to become a monk by his nephew Andronikos III Palaiologos. John Palaiologos (c. 1286–1308), despotes. Bartholomaios Palaiologos (born 1289), died young. Theodore I, Marquis of Montferrat (1291–1338). Simonis Palaiologina (1294–after 1336), who married King Stefan Milutin of Serbia. Theodora Palaiologina (born 1295), died young. Isaakios Palaiologos (born 1299), died young. ↑ PLP, 21436. Παλαιολόγος, Ἀνδρόνικος II. Δούκας Ἄγγελος Κομνηνός. ↑ Agelarakis, P. A. (2012), Cretans in Byzantine foreign policy and military affairs following the Fourth Crusade. Cretika Chronika, 32, 41-78. Bartusis, Mark C. (1997). The Late Byzantine Army: Arms and Society 1204–1453. University of Pennsylvania Press. ISBN 978-0-8122-1620-2. "Andronicus II. ", Encyclopædia Britannica, 9th ed., Vol. II, New York: Charles Scribner's Sons, 1878, p. 23 . "Andronicus II. ", Encyclopædia Britannica, 11th ed., Vol. I, Cambridge: Cambridge University Press, 1911, p. 976 . Laiou, Angeliki E. (1972). Constantinople and the Latins: The Foreign Policy of Andronicus II, 1282–1328. Harvard University Press. ISBN 0-674-16535-7. Κοντογιαννοπούλου, Αναστασία (2004). Η εσωτερική πολιτική του Ανδρονίκου Β΄ Παλαιολόγου (1282-1328). Διοίκηση - Οικονομία. Κέντρο Βυζαντινών Ερευνών Θεσσαλονίκη. ISBN 960-7856-15-5. Nicol, Donald MacGillivray (1993). The Last Centuries of Byzantium, 1261–1453. Cambridge University Press. ISBN 978-0-521-43991-6. Trapp, Erich; Beyer, Hans-Veit (2001). Prosopographisches Lexikon der Palaiologenzeit (in German). I, 1–12, Add. 1–2, CD-ROM Version. Vienna: Verlag der Österreichischen Akademie der Wissenschaften. ISBN 978-3-7001-3003-1.